Happy New Year! Tonight (Jan. 5) wraps up the Christmas season in New Orleans. Tomorrow (Jan. 6) is the twelfth night of Christmas and officially starts the carnival season, which ends with Mardi Gras. There are two parades Tuesday – Joan of Arc and the Phunny Phorty Fellows. It’s a nice tradition – extending Christmas and taking more time to enjoy the festivities. Towns, businesses and residents leave their trees and lights up until Jan. 6. Then, the Mardi Gras decor comes out. Some people even transition their Christmas trees to Mardi Gras trees. Before we dive into the carnival season, we wanted to take a moment to say farewell to Christmas and New Year’s. New Orleans, you sure do know how to do the holidays. 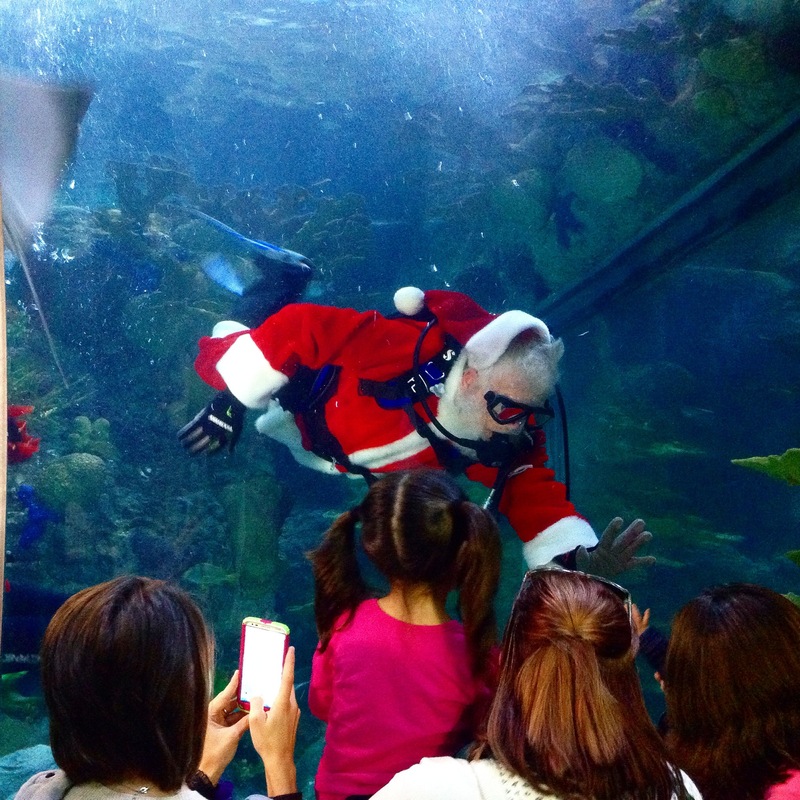 We’ve highlighted some of our favorite holiday events and moments below. What were your favorite holidays moments in New Orleans? Suggestions for what we should do next year? 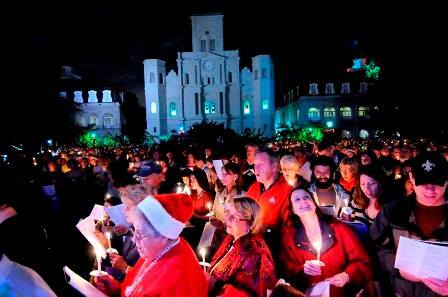 We’re caroling in Jackson Square tonight (Dec. 21) with a thousand or so of our closest friends. It’s a free, magical event in New Orleans. Open to everyone. And again, 100 percent free. The event starts at 7. Gates open at 6:30 p.m.
Song sheets and lights are provided. Arrive early because this is a popular event and you want to get inside the gates. Christmas attire is encouraged. Think sweaters, Santa hats, bells, etc. You stand while you carol so wear comfortable shoes. Don’t bring chairs unless you physically need one. If it is raining, the event will be moved inside the cathedral. Seats/pews are available on a first come, first serve basis. Happy Thanksgiving! Will this be your first Turkey Day in New Orleans? You are in for a treat. Here are some options from our Instagram friends and other people we’ve asked. • Grab your friends and cook a meal for Friendsgiving. 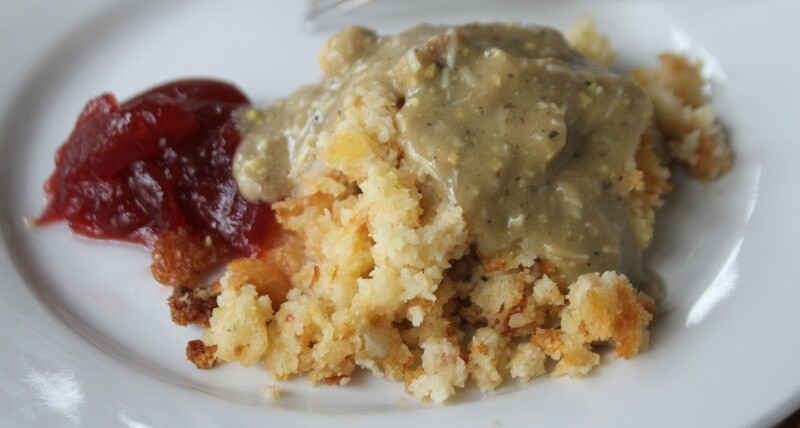 Here are our foolproof recipes for a Southern Thanksgiving, including cornbread dressing. • Head to a restaurant. These 5 places are cooking a classic spread. Don’t want turkey? All of these other restaurants are open. We ventured to the Irish Channel for the St. Patrick’s Day festivities earlier this month. We caught cabbage, kissed strangers for flowers and danced a jig in the streets. Good times. Thank goodness for these parade-going tips from Kim Smelter of New Girl in NOLA. We’ve been doing some of our favorite activities this week – cooking, eating and enjoying time with friends and family. And of course, Southern food makes everything better. A few years ago, I watched food guru Alton Brown propound the virtues of brining a turkey. He explained that the salt water brine changes the turkey’s cellular structure so that it holds more moisture, while seasoning the meat. Boy, was he right! This has been my favorite way to roast a turkey ever since, and I’ve got a least one friend who insists it saved his family holiday meal. Amen, brother. Of course, this recipe and approach can be used with other meats, especially chicken. For example, if you’d like to roast a whole, fresh chicken, half the recipe below. You also should change your perspective on how long to cook the bird. Buy yourself a meat thermometer and cook by the internal temps, not how long it’s been cooking. You’ll be amazed at how much more flavorful the meat will be. Header image is from christmasstockimages.com and is used under a Creative Commons Attribution 3.0 unported license.